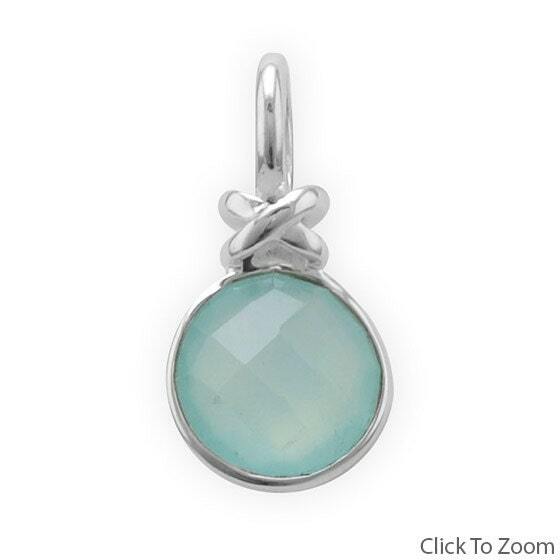 Perfect on a light chain necklace, this gorgeous genuine sea green chalcedony pendant style polished .925 sterling silver charm measures approximately 10 millimeters. It features a stylish "X" design and hangs approximately 22 millimeters. Native American Indians believed chalcedony was a sacred stone and they used chalcedony in the spiritual ceremonies of the tribe. Chalcedony is thought to increase vitality, stamina, and endurance, and to promote emotional balance and charity, while relieving melancholy, fever, gallstones, and eye problems. Salerno's Jewelry Store has an inventory of over 900 different charms so if you can't find the charm you are searching for just contact us and jewelrymandave will be happy to assist you!